The laundry room was one of the rooms that had been damaged when the main bathroom sink had sprung a leak between December 2012 and January 2013. 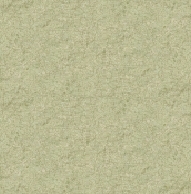 After the contractor had repaired the damaged wall, I painted the room. I had already planned to make and install cupboards in this room so I did not paint these areas of the wall to save on paint. The width of the area that I planned to hang the cupboards was 90" across. I wanted the cupboards high enough so that if a frontloading washer on a pedestal was purchased in the future, it would fit easily under the cupboards. It also had to be high enough to accommodate a top loaded washer's door being opened. In the past we had wire shelves in the room that were too low. We had to pull the washer away from the wall about a foot so we could clear the washer lid from the wire shelves. That left a lot of wasted space in the laundry room. 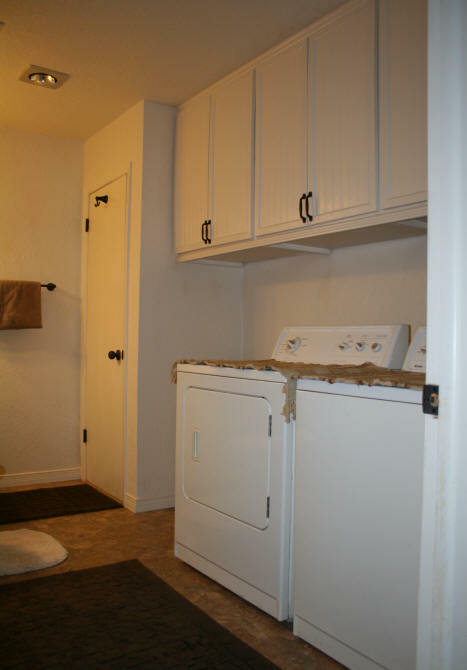 I wanted to be able to push the washer and dryer closer to the wall. The height I decided on for the cupboards was 36" with a depth of 18". There would be three cupboards measuring 30" wide hung on a French cleat. I wanted the cupboards to be strong and sturdy so boxes could be stored in them. So I decided to make them with 3/4" thick plywood. After working out the design in my computer program, I purchased the plywood and cut the pieces to size. I usually buy 4' x 8' plywood and have the major cuts done at the hardware store. It is difficult for me to rip a piece of plywood on my table saw without help. Also, unless I tie the 4' x 8' board down on top of my SUV, I have no other way to get it home. So having the boards cut down to more manageable sizes makes it easier for me to load into the back of the vehicle. I do not have a work bench. My kitchen counter has become my temporary work bench. The kitchen will be the last room renovated in the house so the old laminate counter top will become history. 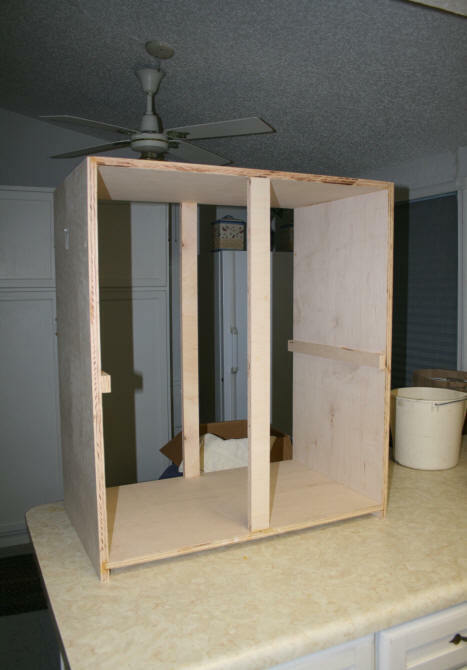 The frame for the first cupboard is pictured above. I decided to only have one removable shelf inside of each cupboard so I made ledges for the shelf to sit on. All of the pieces were glued first and then held together with clamps after I made sure all of the sides were square. When the glue was dry, I nailed all of the pieces together. The bottom shelf of the cupboard is inserted in a dado and I used rabbets to join the top to the sides. I still do not have a router. 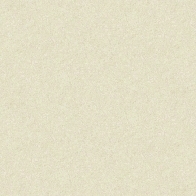 I made the dadoes and the rabbets by making multiple passes on my table saw. All of which I learned how to do watching YouTube videos. The back of the each cabinet was finished off with 1/4" plywood. I made the doors to the cupboards the same way I did the cabinet doors for my hearth shelves using 1/2" blondewood, moulding around the edges, and beadboard wallpaper. The three inside shelves were made with 1/2" plywood. 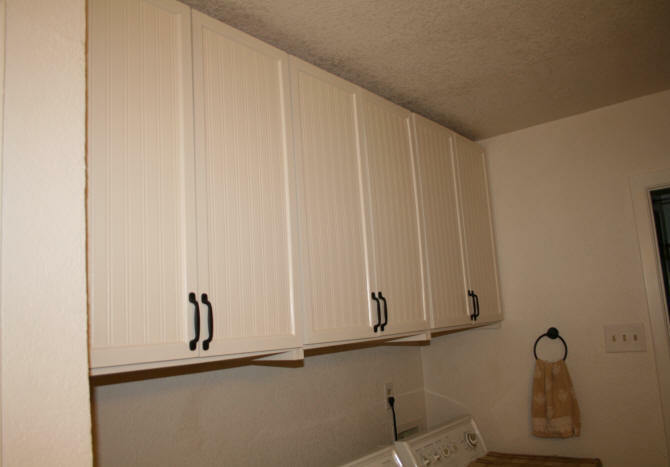 I painted each cupboard and attached the doors while the cupboards were on the floor. Then removed the doors prior to hanging. The top half of the French cleat was screwed into the back of each cupboard. The lower half of the French cleat was mounted on the wall in the studs with 2 1/2" screws. With a French cleat I knew I would not be able to get the cupboard flush with the ceiling which was OK because I intended to put moulding at the top. I was glad I had decided on using this hanging method. The cupboards were heavy once they were finished. I had just enough strength to slide the cupboard up onto the wall until the back of it hooked on the cleat. I then slid the first cabinet over into the corner. Pieces of wood were added at the bottom of the cabinet to make the cabinet parallel to the wall. Yes, that is a piece of pipe insulation material and duct tape below on the washing machine hoses. The original hoses were replaced after the wall repairs were done. The hoses were a little stiff and unruly. The insulation keeps the hoses in place. I hung the final two cabinets in place. Yes, it was a snug fit. 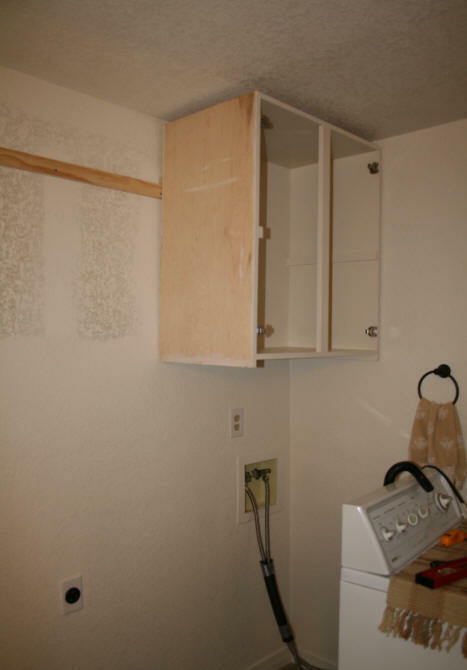 The photograph below shows the three cupboard in place with the cupboard doors placed back on. The moulding at this point had not been added yet. The photograph above shows the completed cupboards after moulding had been added at the ceiling, along the bottom, between the corner cupboards and the walls, and between each cupboard. The moulding was then caulked and painted. The photo on the left shows another view of the completed laundry room from the doorway. There is a sink and a toilet on the other side of the room. 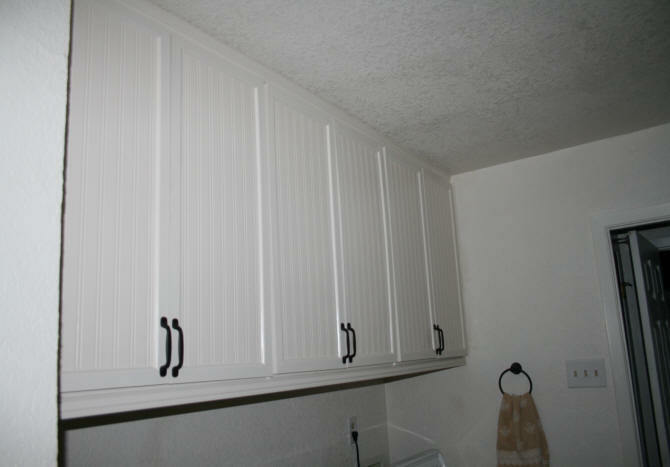 I still want to add moulding around the ceiling in the laundry room but I have not done this yet.